Sidney George Pippard was born in Preston Plucknett in 1898, the son of shoe maker and leather agent George Walter Pippard (1866-1942), from Islington, London, and dressmaker Sarah née Barnett (1867-1928) of Mudford. The Pippards were originally a Montacute family, plasterers by trade for generations. George's father Paul, moved to London where his first wife and daughter died of tuberculosis in 1865. Paul remarried and had two children; George and Ellen. What happened later is a mystery but by 1870 the two children were in the Yeovil workhouse, the entry in the register is 'deserted by parents'. George was later apprenticed to a shoemaker, he did well and had his own business in Watercombe, Yeovil. Sidney was the seventh of eleven children. In the 1901 census the family, including 2-year old Sidney, were living in Watercombe. In the 1911 census the family were still living at Watercombe and Sidney, now 12, was at school. When he left school he became an assistant to local baker, Mr E Old. Sidney enlisted around Christmas 1916, joining the 8th (Service) Battalion, Lincolnshire Regiment. His Service Number was 41672. The 8th Battalion had been formed at Lincoln in September 1914 as part of K3 and came under command of 63rd Brigade in 21st Division. On 10 September 1915 the battalion landed at Boulogne. On 8 July 1916 it transferred with the 63rd Brigade to 37th Division. Sidney joined his battalion at the front around May 1917. At the time Sidney arrived at the Front his battalion was recovering from playing its part in the First and Second Battles of the Scarpe and the Battle of Arleux - all during April 1917. After a period of relative calm, the battalion - including Sidney - was then engaged in another battle, the Battle of Pilkem Ridge. This battle was the opening attack of the Third Battle of Ypres, which later became known as Passchendaele. The battle began at 3:50am on 31 July 1917, when 2,000 Allied guns opened fire on German lines and 14 British and two French divisions attacked along 15 miles of the Front. On the afternoon of 31 July, rain began to fall on the battlefield. Over the following days the shell-damaged ground became a quagmire, severely hampering the advancing troops, and making the movement of artillery, casualties and supplies very difficult. After three days, the Allied advance was half of what had been planned. The British Army had suffered some 27,000 casualties wounded, killed and missing. Most of the dead have no known grave. Sidney was reported missing on the first day of the battle, 31 July 1917, and confirmation that he was killed on this day came the following month. He was just 19 years old. The official War Diary of the 8th Battalion, Lincolnshire Regiment records for the 31 July, the day Sidney died, "July 31 - Attack at Riffle Farm. Casualties - 7 officers, 170 other ranks". Sidney would have been one of those 170 other ranks casualties. In its edition of 7 September 1917, the Western Gazette reported "Preston Plucknett - Mr and Mrs GW Pippard, of the village, have received an official information from the War Office, stating that their third son, Private Sidney George Pippard, who is with the -- Lincs Regiment, has been reported missing by the Commanding Officer. Private Pippard, before joining the Army about six months ago, was employed as a baker's assistant by Mr E Old, of this village. He was 19 years of age, and has one brother a prisoner of war in Germany, and another [Imbert 'Bertie' Pippard] was killed by gas just over a year ago." The Western Gazette, in its edition of 5 October 1917, reported "Preston Plucknett - Mr and Mrs GW Pippard, of this village, have received an official intimation from the War Office, stating that their fourth [sic] son, Private Sidney George Pippard, of the Lincoln Regiment, was killed in action on July 31st. Private Pippard, who had only been in the Army about six months, had served three months in France. Before joining the Army he was employed by Mr Old of Preston, as baker's assistant. This is the second son to have been killed in action, whilst another, Private Victor Pippard, is a prisoner of war in Germany. Much sympathy has been expressed with the bereaved parents." 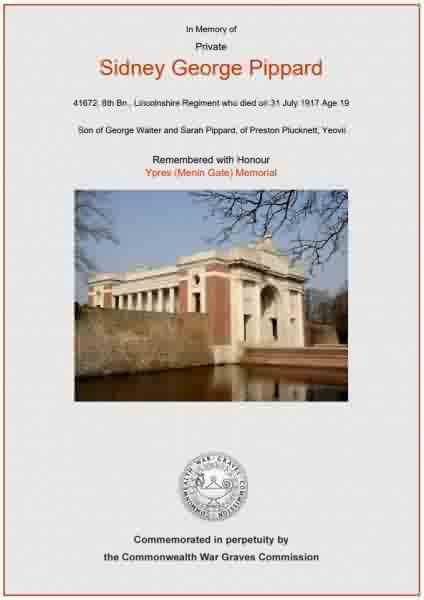 Sidney Pippard is remembered on Panel 21 of the Ypres (Menin Gate) Memorial and his name is recorded on the Preston Plucknett War Memorial. The Commonwealth War Graves Commission certificate in memory of Sidney Pippard.